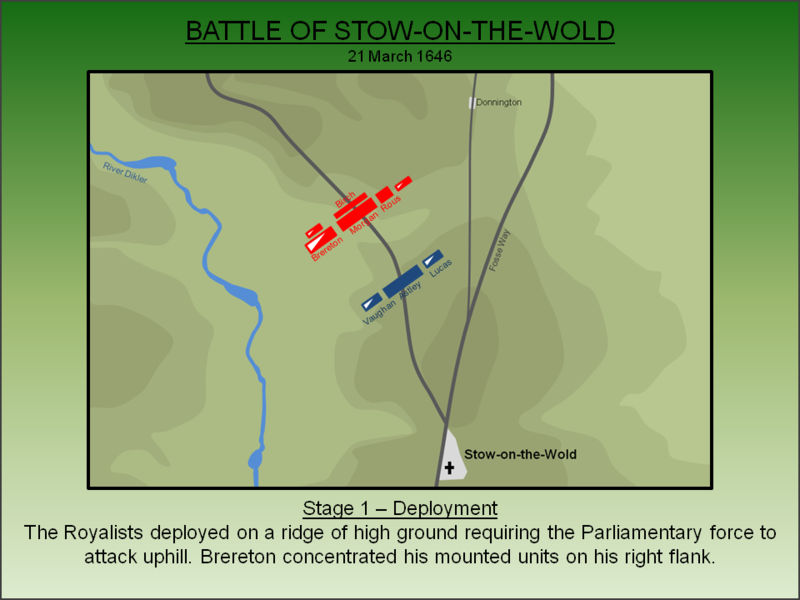 The Battle of Stow-on-the-Wold (1646) was the last engagement of the First Civil War and saw the sole remaining Royalist field army destroyed. With the King's cause now irretrievably lost, the Royalist commander pointedly observed to his captors, "You have now done your work boys and may go play, unless you will fall out amongst yourselves". It was a prophetic statement. By the end of 1645, after three years of civil war, Parliament had finally gained the upper hand. The north had fallen following the Battle of Marston Moor (1644) whilst, in the south, the Royalists had suffered catastrophic defeats at the battles of Naseby (14 June 1645) and Rowton Heath (24 September 1645). Royalist forces in Scotland had also been decisively defeated at the Battle of Philiphaugh (13 September 1645). Whilst the wiser men around the King knew that the war was now lost, the intransigent Charles I refused to accept defeat. He sent the shattered remains of his main army north under the command of Lord George Digby and Marmaduke Langdale but they were defeated at the Battle of Sherburn (15 October 1645). The King then placed his hopes in recruiting a new army from the Welsh Marches and West Midlands. Charles I appointed Sir Jacob Astley with the task of raising the new army. Once assembled, he was under orders to march to the relief of Banbury, one of the key outposts protecting the Royalist capital at Oxford. Thereafter the King wanted Astley's force to relieve the besieged port of Chester through which Charles hoped to import Irish soldiers once a treaty had been agreed with the Catholic Confederation. Astley had a difficult task. He commenced a recruitment drive in Wales and in the border counties but was also relying on drawing troops from the Royalist garrisons spread across the Midlands and also a successful rendezvous with Lord George Goring in the South West. However, Goring's force was defeated and destroyed at the Battle of Torrington on 16 February 1646. Concurrently Astley alienated the key Royalist in the Midlands - Henry Hastings, Lord Loughborough - who then decided to give up the cause and surrendered his large Royalist garrison at Ashby de la Zouch. Nevertheless, by early March Astley had achieved his aim and mustered a small but credible army and was ready to march towards Oxford. 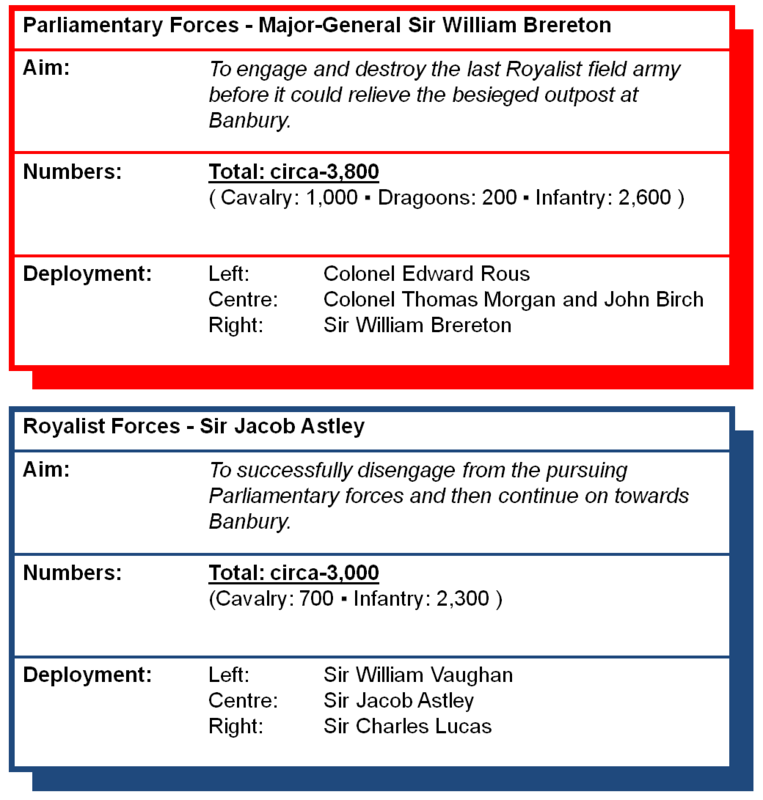 Astley's force was the last Royalist army in the field and Parliament dispatched Sir William Brereton to destroy it. As Astley moved south-west out of the Midlands, he skirted around the Parliamentary held garrison at Evesham and crossed the River Avon via a bridge of boats near Bidford. He was pursued by Brereton who moved south from Lichfield with 1,000 cavalry. Numerous skirmishes followed as Brereton's men harassed the Royalists but the Parliamentary commander held back from a full engagement as he was seeking to rendezvous with a larger infantry detachment, under Colonels Thomas Morgan and John Birch, which was approaching from Gloucestershire. These two forces successfully linked up on the evening of the 20 March 1646 near Longborough, a small hamlet just to the north of Stow-on-the-Wold. The Royalist commander knew that the proximity of such a large enemy force meant he could not avoid battle else his force would just be destroyed piecemeal whilst on the march. However, he was also painfully aware many of his recruits were inexperienced. 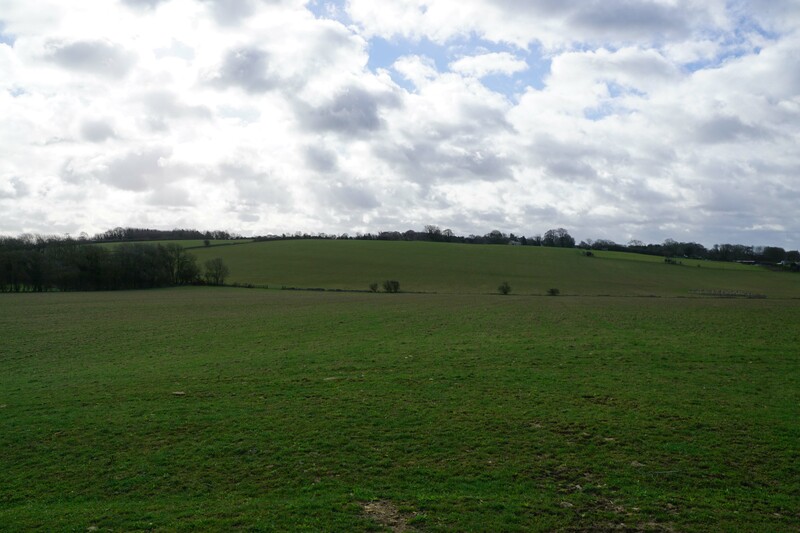 Accordingly he sought a strong defensive position and chose a ridge of high ground just to the north of Stow-on-the-Wold. The Royalist force was under the Command of Sir Jacob Astley, a respected 66 year old veteran from the wars. His cavalry was around 700 strong and predominantly consisted of veteran survivors from earlier Royalist campaigns. His infantry force had been recruited from Shropshire, Staffordshire and Worcestershire. Some of these troops had been drawn from Royalist garrisons across the Midlands region and had varying degrees of military experience whilst others were raw recruits. Opposing them was an army under Sir William Brereton, Member of Parliament for Cheshire and arguably the greatest Parliamentary commander of the wars. His troops were experienced veterans who were fully integrated in experienced and well drilled Regiments. Whilst the overall size of Brereton's army is disputed, it was certainly larger than the Royalist army. The precise location of the battle is intensely debated. 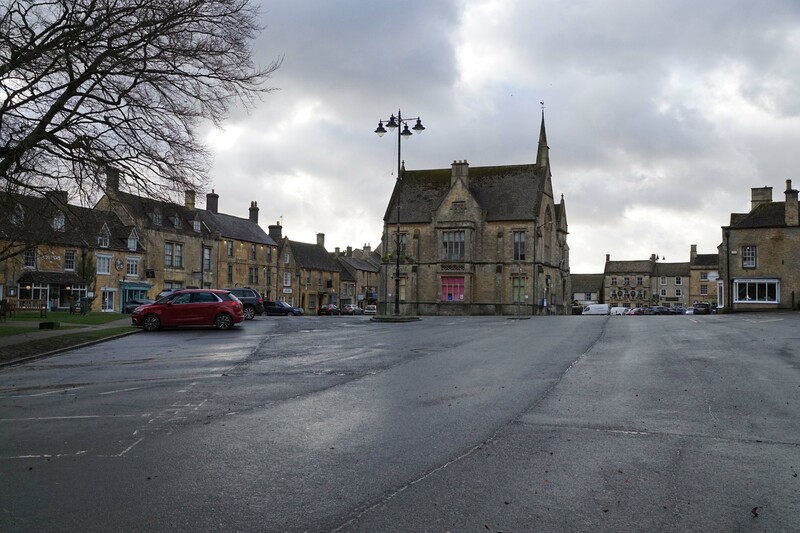 Whilst the final stages of the action are securely placed in the Market Square of Stow-on-the-Wold, it is not certain where the main engagement was fought. Some authors suggest Astley drew up on the ridge just to the east of Donnington and place the Parliamentarians near Longborough to the north-east of that site. If this is correct then it puts the battlefield monument to the rear of the Royalist position. 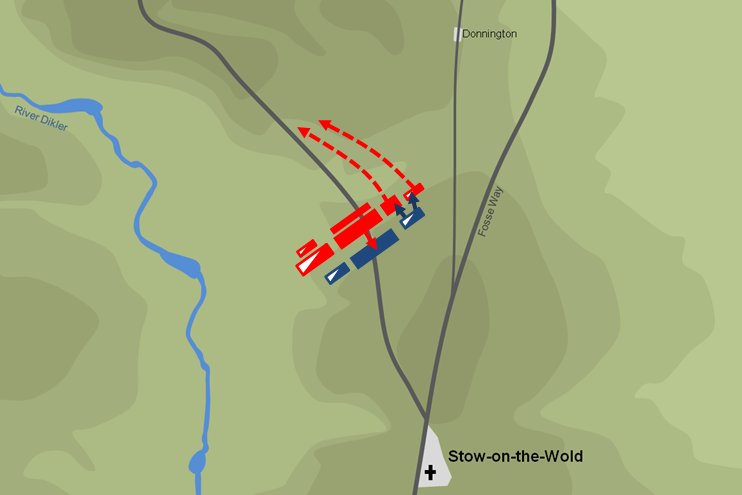 However, recent analysis of the battle suggest it was fought much closer to Stow-on-the-Wold than previously thought. 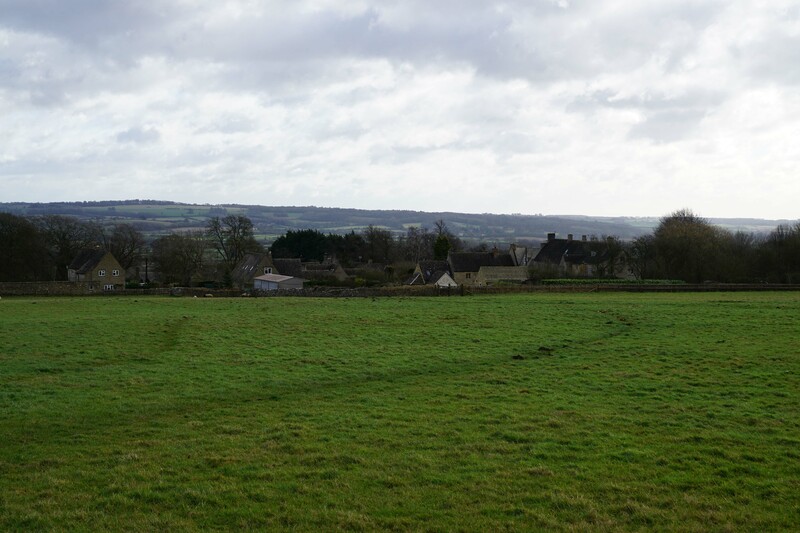 In such a deployment the Royalists are placed on the high ground immediately to the north of Stow-on-the-Wold with the Parliamentarians to the south-west of Donnington. Given the Royalists were still a composite fighting force when they reached the town in the closing events of the battle, this latter location would seem the more probable site for the battle. Accordingly this interpretation of the action follows that scenario. 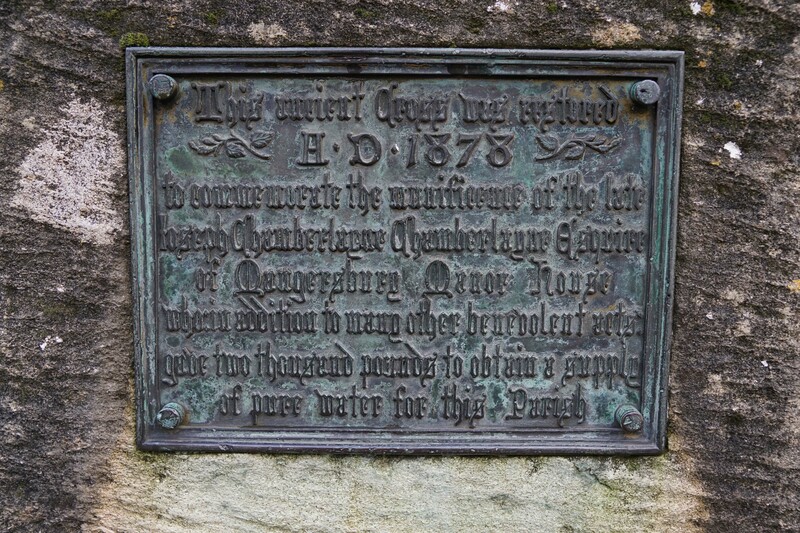 The battle was fought in the early morning on 21 March 1646. Before dawn the Royalists moved into battle array on a ridge of high ground to the north of Stow-on-the-Wold. It was a strong position that would require a concerted uphill attack to dislodge them. Astley adopted a traditional battle formation with infantry in the centre and his small cavalry divided into two formations on his left and right wings. The Parliamentary force, now fully resolved to battle, had shadowed the Royalist movements and deployed in their own formations directly to the north. Brereton placed the bulk of his mounted forces on his right wing directly under his own command. In the centre, under Colonel Morgan, were his veteran troops whilst his left wing consisted of a small cavalry detachment and 700 Gloucestershire men under Colonel Rous. A small reserve was commanded by Colonel Birch. The Parliamentarians commenced the attack shortly after dawn by advancing their entire line towards the Royalists. The dominant Royalist position paid dividends in the early stages of the fighting with the Parliamentarians struggling to make progress as they advanced uphill. The Parliamentary left flank, under Colonel Edward Rous, suffered badly and broke into retreat. In the centre a stalemate ensued with the high ground enabling the Royalists to hold out against the greater Parliamentary numbers. Neither side were able to gain an advantage. Despite the defeat on the left and stalemate in the centre, the Parliamentary right had more success. This was under the direct command of Sir William Brereton and consisted of a combined cavalry and dragoon force. Brereton charged his men into the Royalist left. 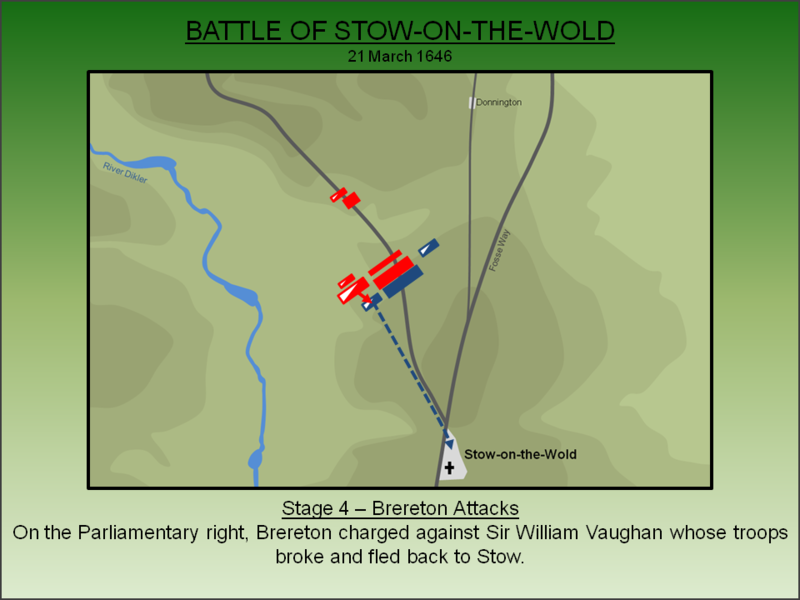 The vastly outnumbered men under Sir William Vaughan's cavalry broke and retreated from the field back towards Stow-on-the-Wold. The battle saw the total destruction of the last Royalist field army. There was no chance whatsoever of achieving control of a port for importing troops nor relieving any of the Royalist garrisons across the country. Many of these Royalist held outposts started surrendering with the last - Harlech Castle - finally giving up in March 1647. The defeat at Stow also made King Charles realise he had few military options left and surrendered to the Scottish forces besieging Newark on 6 May 1646. He hoped to drive a wedge between the Scots and their English Parliamentary allies but the former simply sold their monarch to the latter. However, within just a few years of the end of the First Civil War, division did indeed spread throughout the anti-Royalist forces. Parliament itself, the navy, Scotland, Wales and the Irish all rose against the New Model army which defeated them all and then executed the King. Hacket, M (2011). Lost Battlefields of Britain. History Press, Briscombe. Historic England (2016). 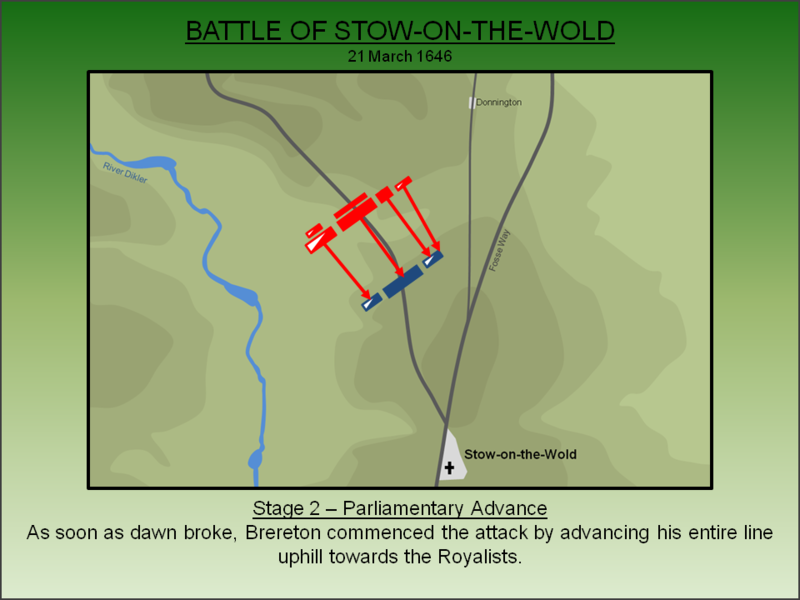 Battle of Stow (-on-the-Wold) 1646, List Entry 1000037. Historic England, London. Lancaster, J.H.D (2017). 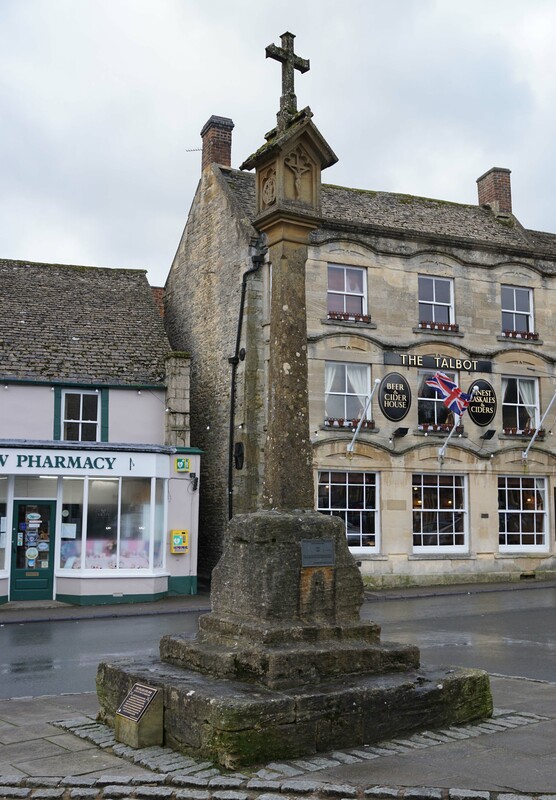 Stow-on-the-Wold: Battlefield visit notes and observations. CastlesFortsBattles.co.uk. Ordnance Survey (2015). Stow-on-the-Wold. 1:1250. Southampton. 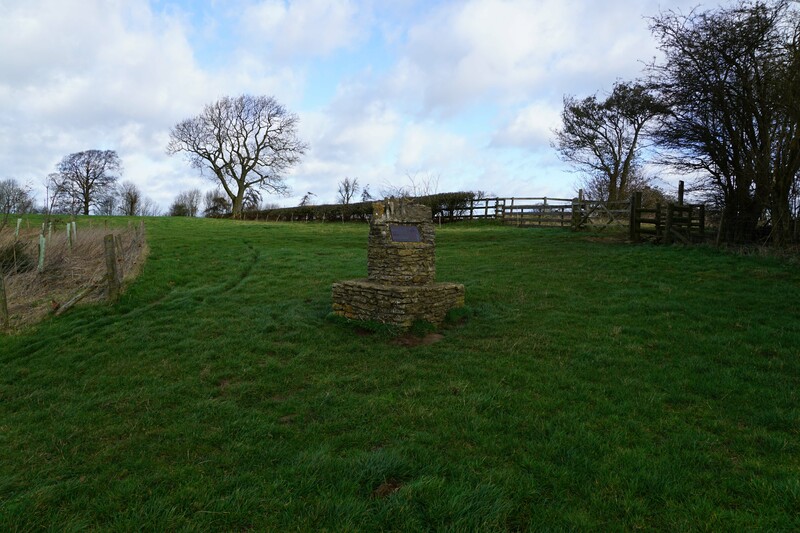 There is a battlefield monument that straddles the multiple locations mooted for the main action and the wider battlefield area is easily accessible via a number of rights of way and roads. 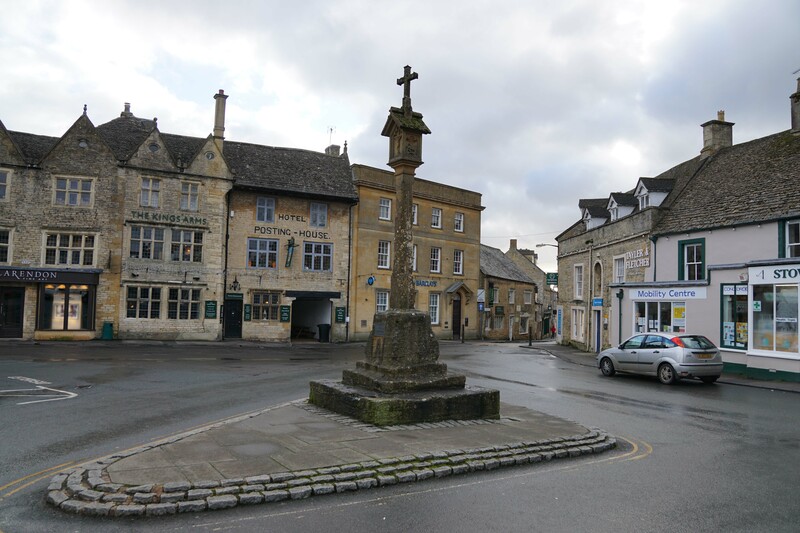 In Stow-on-the-Wold visitors can see both St Edward's church, where Royalist prisoners were held after the battle, and the Cross by which Astley sat as he awaited his captors' pleasure. Battlefield Monument. If the battle was fought in the northern location then this monument marks the Royalist position. 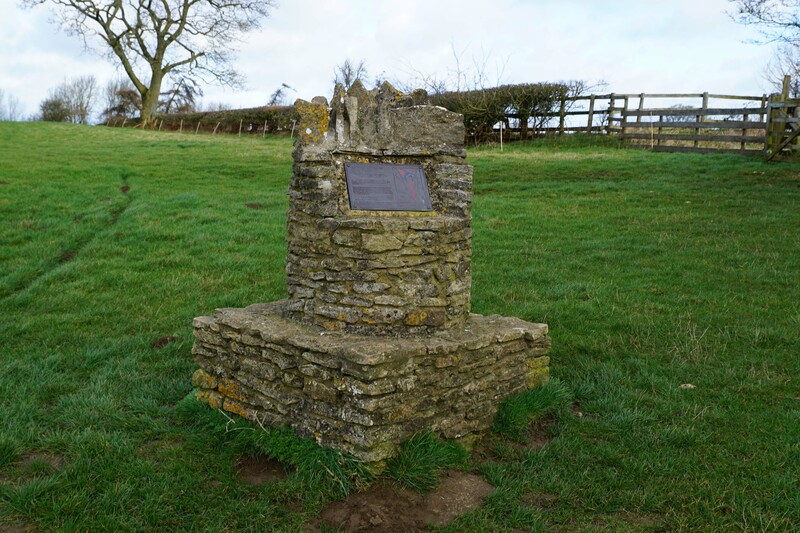 However, if it was fought closer to Stow-on-the-Wold then the monument is in proximity to where the Parliamentary forces mustered. View South from Monument. 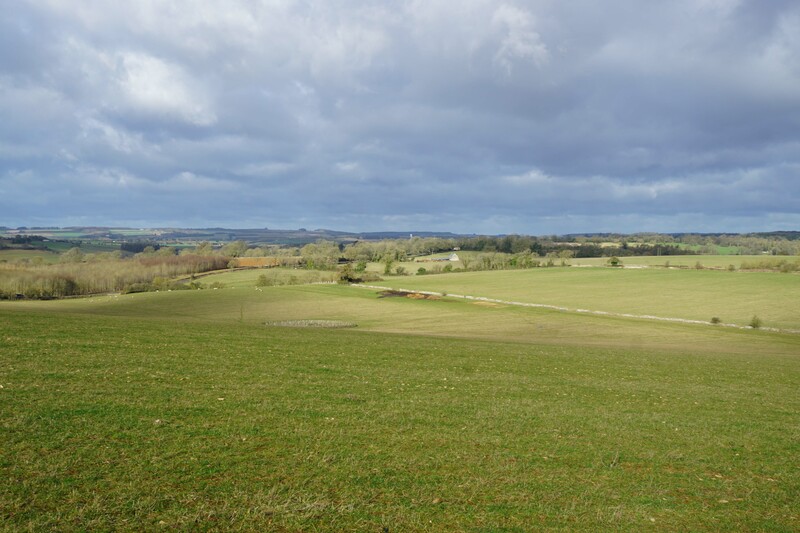 The view south from the monument looking in the general direction of Stow-on-the-Wold. Donnington. The small hamlet of Donnington lies to the east of (both) likely battlefield sites. 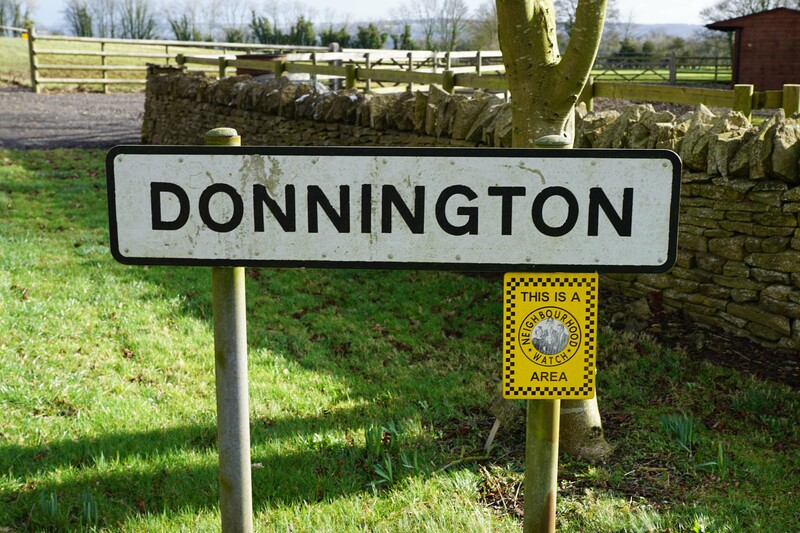 Donnington Road was probably little more than a track at the time of the battle. Royalist Position. If the southern location is correct, the Royalists deployed on top of this hill. Battlefield. The battlefield as viewed from the Fosse Way. Stow-on-the-Wold Town Square. The town square was the scene of the final phases of the fighting. When the Royalists found themselves surrounded with no hope of retreat, Astley ordered them to surrender. St Edward's Church. The church was used to hold Royalist prisoners after the surrender. There is a memorial to the Royalist Captain Keyt within. Market Cross. Following the battle, Sir Jacob Astley sat on a drum talking to his captors. "You have now done your work boys and may go play, unless you will fall out amongst yourselves". It was a prophetic statement. 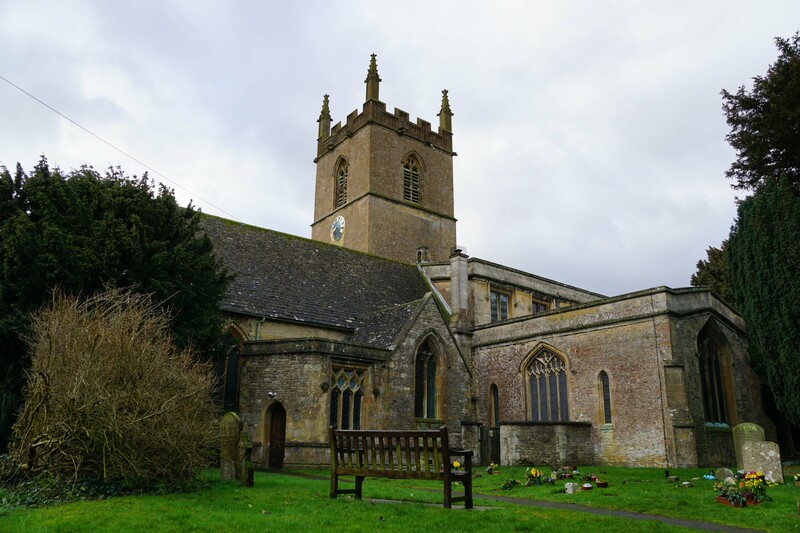 Stow-on-the-Wold is found fifteen miles to the east of Cheltenham. There is car park in the Market Place, the scene of the final phase of the battle, and both the Market Cross and St Edward's church are adjacent. 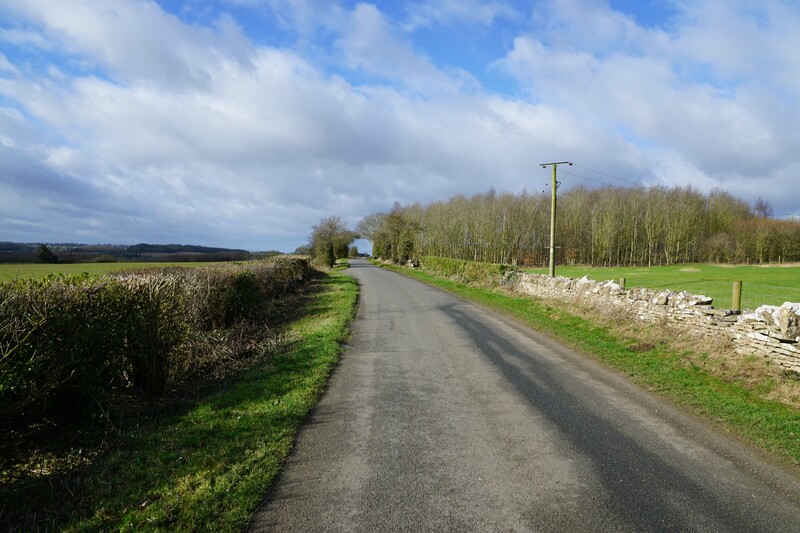 Around 0.5 miles to the north off the A429 is a lay-by and right of way from which the battlefield can be explored. Whilst it is possible to walk from Stow, visitors should note that doing so would require walking a portion of the way along the grass verge of the very busy A429.